A bit of a slapstick theme running through these next three entries, plus several hundred words about three clips that probably make up less than a minute between them. Anyway, as Tiswas was to the kids and teens of the late seventies and early eighties, so The Big Breakfast was to the mid-nineties in terms of its popularity and influence, and it only looks less impressive twenty years on as it was ripped off by virtually every other programme on TV. 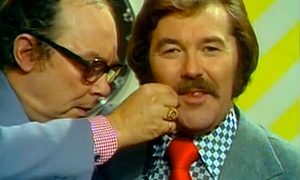 Of course the responsibility for the show’s success rests firmly on the shoulders of Chris Evans who appeared to spring from nowhere (in reality, TV-am and GLR) to become the ultimate unflappable TV host. The amount of originality and innovation in the first year or so was staggering as the show subverted all the clichés of television and this brilliant moment is a great example. Sadly until someone puts the full version (which was on the Best Of VHS they released) on YouTube, this truncated clip is the best we’ve got, so to set the scene, the news was over and Peter Smith handed back to Chris and Gaby, though as the camera panned across to their seats… they were hiding! A lovely bit of spur-of-the-moment improvisation, there are few other places on TV where you could have a daft idea like that and then immediately do it. So far so amusing at half seven on a Monday morning, certainly compared to the opposition, but of course the highlight is when Evans got a bit overexcited by the gag, jumped onto his chair and promptly went flying, crashing head first into the coffee table to hysterics from the crew. After that, a slightly dazed Evans continued with the link, then after a moment’s reflection, announced “That was a major stumble!” The energy of the whole thing is a wonderful example of how The Big Breakfast broke away from the relentless blandness that characterised breakfast TV up to that point. Incidentally, the other moment of TV history in that clip is that Evans is in the midst of asking viewers what lies they were told as a child, which we believe was the first ever appearance on television of that story about the ice cream van ringing its bells meaning they’ve run out of ice cream, as repeated on every single TV and radio show ever since.